There are many benefits to using smart lighting products in your home. Smart bulbs can increase energy efficiency, comfort, and ease of use. But that’s not all! As Philips Hue first proved when introducing its color-changing bulbs 4 Ways Philips Hue Can Push Your Lighting to the Next Level 4 Ways Philips Hue Can Push Your Lighting to the Next Level Without Philips Hue, however, the smart home concept might never have gotten off the ground. Here are some cool ways to make use of them. 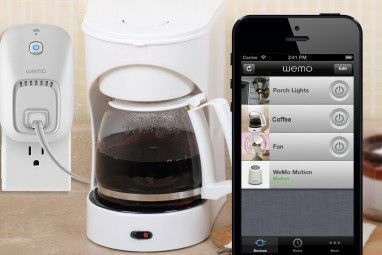 Read More in 2012, smart lighting products can also provide a lot of fun. In this article, you’ll learn about three unique and fun smart lighting products on the market. If you want to turn your everyday home lighting into a work of art or increase its functionality, these products may be the perfect fit for you. These include the Nanoleaf Aurora, Stack lighting, and the Sengled Pulse. Nanoleaf has offered green lighting products since 2013. However, it wasn’t until late 2015 that the company introduced its first smart product, the Nanoleaf Ivy Smarter Kit. Building on the success of the Ivy, Nanoleaf next added something entirely different to its product lineup: the Nanoleaf Aurora. This smart light offers color changing and voice control abilities in a unique design. I first saw the Nanoleaf Aurora in October 2016 at the MoMA Design Store online. Almost immediately, I fell in love with its unusual design. Once I read about Nanoleaf’s plans for the product in 2017, I finally brought one into my home. 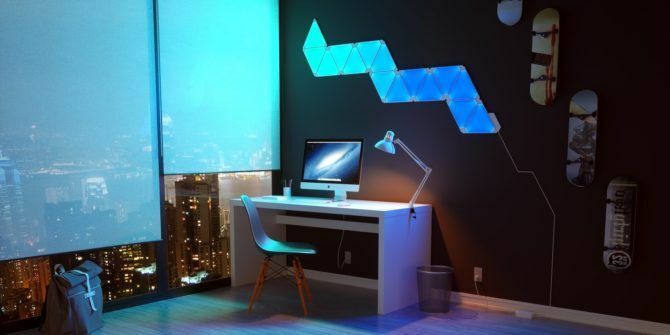 The Nanoleaf Aurora is made up of triangular panels that attach via small connectors. The Nanoleaf Lightning Smarter Kit comes with nine modular panels and a controller unit. With expansion packs, you can have up to 30 panels with each installation. 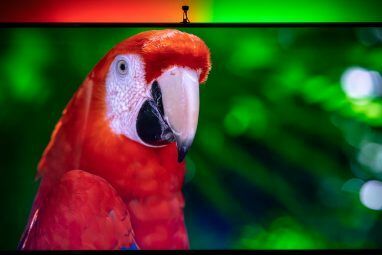 You can organize your Nanoleaf Aurora smart lighting panels How Smart Lighting Affects Your Health (According to Science) How Smart Lighting Affects Your Health (According to Science) Several scientific studies have indicated many influences of lighting on our mental and physical health. Thankfully, smart lighting can help you achieve all of these benefits in just a few simple steps. Read More into any number of patterns. There are suggestions in the quick start guide, but your options are limitless. Once you decide on your design, use the included double-sided adhesive mounting strips to place your creation on a wall. Be careful here, as you can’t remove these strips quickly without also causing damage to your wall. Want something less permanent? Arrange your Nanoleaf Aurora on a table for easy removal. To control your lights, use the free Nanoleaf app (iOS and Android). This is where you’ll find an ever-growing list of scene templates. You can also create your own with ease using the Aurora Canvas tool. Nanoleaf Aurora is also compatible with Apple HomeKit Put Apple HomeKit Devices to Good Use With Automation Put Apple HomeKit Devices to Good Use With Automation Have more than one accessory compatible with Apple HomeKit? Learn how to use Automation to truly brings some smarts to your home. 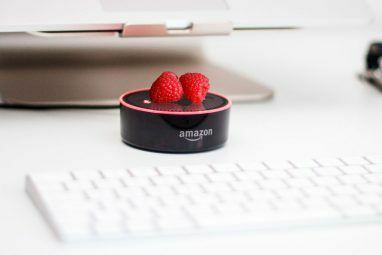 Read More and Amazon Alexa. These integrations allow you to control your lights just by using your voice. Rather not use a smartphone? The controller unit also allows you to select a saved or preloaded scene with a touch of a button. The Nanoleaf Aurora has a lot going for it. Nanoleaf plans on adding two new Aurora accessories in the coming months. These include the Aurora Rhythm, which allows your lights to react to music and sound The Best iPhone Music Apps & Alternative Music Managers for iOS The Best iPhone Music Apps & Alternative Music Managers for iOS There are many ways to listen to music on your iPhone, and you don't have to rely iTunes and the built in Music app. Read More , and the Aurora Remote, which will include an internal gyroscope and accelerometer, allowing for a broad range of motion commands. Before the end of the year, Nanoleaf is also expected to add an Aurora ceiling mount, Google Home integration Use Google Home to Remember Where You Put Your Stuff Use Google Home to Remember Where You Put Your Stuff Google Home is useful for so many things, but perhaps one of the more practical benefits is the ability to remember where you put your things. Read More , DMX support, and more. You can purchase a Nanoleaf Aurora starter kit for $200 via the Nanoleaf website. Though it might not have the same “wow” factor as the Nanoleaf Aurora, Stack is a unique lighting solution that may more easily blend in with your existing decor. Stack lights automatically respond to changes in an environment’s ambient light and the time of day. The lights are able to regulate their brightness and color temperature without your intervention. Circadian lighting — Stack intelligently adjusts the color temperature based on the time of day, which can help to optimize your sleep/wake cycle. While Stack strives to minimize user interaction, many of the features found on other lighting solutions remain. For example, with the mobile Stack app, you can change the color temperature and brightness of the bulb and schedule wake-up times. You also have the ability to turn off the occupancy and ambient light sensors as needed. Thanks to IFTTT, you can also link 13 Wacky Ways to Beat Procrastination With IFTTT 13 Wacky Ways to Beat Procrastination With IFTTT Squeeze more out of your work time. Solve the productivity puzzle by keeping distractions and procrastination at bay with these smart IFTTT recipes. Read More other connected lights to your Stack lights. For example, you can use an IFTTT applet to turn on your Philips Hue or LIFX lights every time Stack detects occupancy. Stack lights currently work with Amazon Alexa and Google Nest, and will soon offer compatibility for the Apple HomeKit ecosystem. One of the reasons I put Stack on this list is because of the emerging Stack Enabled program. With this program, Stack allows other lighting manufacturers 7 Creative Uses for Colored LED Home Automation Lighting 7 Creative Uses for Colored LED Home Automation Lighting Turning on your lights automatically is certainly cool, but it doesn't take advantage of the full spectrum of colors available with RGB lighting. For that, we need to get creative. Read More to embed Stack’s active sensor and signal processing technology into different lighting formats. In other words, the features that make Stack unique could soon show up on many of your other favorite smart lighting products. Stack currently offers two starter packs through its website. The Stack Classic Starter Kit [No Longer Available] includes two A19 bulbs and one hub. The Stack Downlight Starter Kit [No Longer Available] consists of two BR30 bulbs and a hub. A19 bulbs are priced at $28 each, while individual BR30 bulbs cost $45. Every room in your home needs at least one light. Thanks to the Pulse by Sengled, you can now have a speaker in every room too. Pulse combines the energy efficiency of a dimmable LED light with the high-quality audio of a JBL Bluetooth speaker. The result is an extraordinary and practical mix of light and sound. The Pulse twists into any standard E26/E27 light socket, requiring no extra speaker wires or power cords. You can add as many as eight Pulse bulbs to your setup, depending on the size of your home. Use the free Pulse app for iOS or Android to control light dimming and sound volume. You can also launch media players like Pandora and Spotify directly from the mobile app. Want to move beyond streaming music from your mobile device? You can add your existing subwoofer to enhance the bass of your Pulse sound system using the Pulse Amp. With the Pulse Link [No Longer Available], you can play sound from your TV or another non-iOS or non-Android device. Sengled also offers the Solo, an LED with a stereo speaker intended for one room use. The company’s newest product, Element, is similar to Stack lighting. It allows you to set the lighting in your home according to the time of day. You can also use the Element app to set lighting remotely. The Pulse starter kit ($150) features a master and satellite bulb and is available in candy apple, white, and pewter. Whether you want to install smart lighting that looks like a piece of art, add bulbs that change based on the time of day, or enjoy music across multiple rooms, these unique solutions have you covered. Each can provide years of enjoyment and use. Which of these smart lighting products do you find most interesting? Let us know in the comments below. Thanks for the information. We have been using bulbs from BeON home in my house and I find they are very easy to use. My husband did not want to use an app to control lights, do these systems required the light switch to stay in the ON position to work? Thank you for sharing this wonderful information. This information helpful for many people and in this post give explanation for unique smart light and for that in this post give some light images that helpful for people.